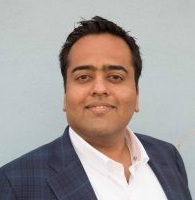 Madhavan Ramanujam is a board member and partner at Simon-Kucher & Partners based in its San Francisco/Silicon Valley office. Advising companies of all sizes from Fortune 500s to startups, Ramanujam has led more than 125 monetization projects for Internet, software and technology clients, helping bring numerous new products to market. 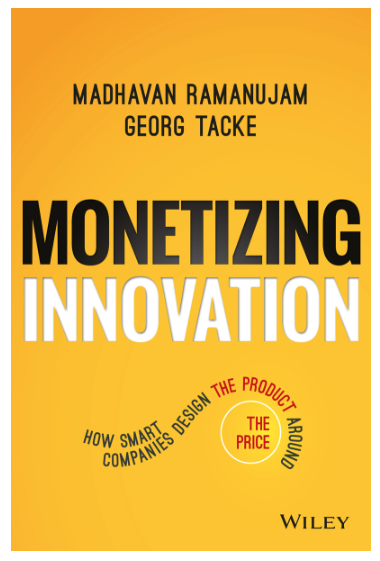 With co-author Georg Tacke, he’s written an instant classic – Monetizing Innovation: How Smart Companies Design the Product around the Price. Companies invest substantially in designing and building products. Yet they struggle to monetize them. Billions of dollars are spent and lost every year because more than 70 percent of innovations fail to meet financial goals – or fail entirely. We spoke to Ramanujam about what creates success and how to avoid becoming another statistic. Monetizing Innovation is an eye-opener. What brought the two of you together to write it? Every other year, Simon-Kucher & Partners conducts the world’s largest pricing survey. What we have found is that 72 percent of new products introduced over the past five years have failed. The failure rate is so high, in part, because the factors leading to innovation are under pressure. Traditional research and development is becoming more expensive and disruptive innovation is coming from smaller, nimbler companies. At the same time, the rate of innovation is accelerating around the globe, with Asian countries rapidly growing their share of global R&D spending. We wanted to analyze how these factors are attributing to new product failure, and come up with solutions to avoid these startling failure rates. Y our work has identified the patterns of failure. What are the four ways that companies fail when it comes to monetizing innovation? The good news is that we found only four ways for innovation efforts to fail. Cramming too many features into one product creates a product that does not fully resonate with customers and is often overpriced. We call this feature shock. A minivation is an innovation that, despite being the right product for the right market, is priced too low to achieve its full revenue potential. There are also hidden gems, or potential blockbuster products that are never properly brought to market, generally because they fall outside a company’s core business. Finally, when companies bring to market an innovation that customers don’t want, we call it an undead. You’ve also identified 9 ways companies can avoid failure. Can you go over each one briefly? Have the “willingness to pay” talk with customers early in the product development process so you know whether you’re building something customers will pay for. Don’t force a one-size-fits-all solution. Build segments based on differences in your customers’ willingness to pay for a new product. Product configuration and bundling is more science than art. Choose the right pricing and revenue model. How you charge is often more important than how much you charge. Develop your pricing strategy. Look a few steps ahead to maximize gains in the short and long term. Draft your business case using customer willingness-to-pay data, and establish links between price, value, volume, and cost. Without this, your business case will tell you only what you want to hear, which may be far afield from market realities. Communicate the value of your offering clearly and compellingly; otherwise you will not get customers to pay full measure. Understand your customers’ irrational sides, because whether you sell to other business or to consumers, your customers are people. Maintain your pricing integrity. Control discounting tightly. If demand for your new product is below expectations, only use price cuts as a last resort, after all other measures have been exhausted. Can you give us an example of a company that succeeded and one that failed? One example we mention in a recent Harvard Business Review article is Taiwanese computer maker Asus. In 2008, the company came to market with a computer priced even lower than its traditionally low-priced offerings with a price tag of €299. Consumers flocked to it and it nearly sold out within days in countries like Germany and France. Asus priced low to rapidly gain market share but didn’t have the supply when demand far exceeded its projections. On the other side we have Porsche and its introduction of the Cayenne. Porsche’s Cayenne product team conducted painstaking research to confirm that customers would pay more for a Porsche SUV than they would for similar vehicles built by other companies. Before they began product design, Porsche surveyed target customers on every single feature the car might possibly have, and gauged their willingness to pay for those features. If customers valued and were willing to pay for them, they were in. If not, no amount of convincing from Porsche engineers could overrule the end user. When the Cayenne came to market in 2003, it was an instant hit. By 2015, it generated about half of Porsche’s total profit. Wow. Is there a process companies should follow if they want to succeed? The number one success factor is C-level involvement. Having senior leaders participate in pricing discussions is a must. They don’t need to be part of every discussion, but CEOs do need to make pricing and new product development their priority. You also say that “how to charge for the product is far more important than the price itself.” What do you mean by that? We identified five monetization strategies that should be considered. For instance, will it be a subscription or a transaction? Will it be bundled with something else? Can you give us more specifics about these 5 models? In the Subscription Model, the customer provides periodic and automatic payment for continued delivery of (or access to) a company’s offering. With Dynamic Pricing, a product’s price fluctuates based on factors such as season, time of day, weather conditions, or other considerations that could impact willingness-to-pay, demand, and supply. Market-Based Pricing Auctions set prices based on competition for goods or services. Many companies have succeeded by pricing transactions on Pay As You Go measures. Often these alternative metrics are closer to product value and customer benefits. With the Freemium Pricing model, a company offers two or more tiers of pricing for its products and services, one of which is free. The goal of a freemium monetization model is to attract a huge customer base to the free version and later convert a significant percentage to paid subscriptions. There are only three pricing strategies startups should pursue: maximization, penetration and skimming. Startups should pursue maximization in the short term when there are no clear differences in customer segments’ willingness to pay, and when the optimal short term and long term prices are equal. A bottoms-up penetration strategy is used to win dominant market share. You price the product low to minimize adoption friction, grow quickly, and then move up-market after developing broad adoption. Starting with a high price and systematically broadening the product offering, or skimming, addresses more of the customer base at lower prices. Apple sells the latest iPhones at the highest prices, and repackages older models at lower prices to address different customer segments. You know, Steve Jobs was both a product genius and pricing genius. He’s not given credit for his pricing genius. It was by pairing the two skills that he led Apple to record-breaking profits quarter after quarter.